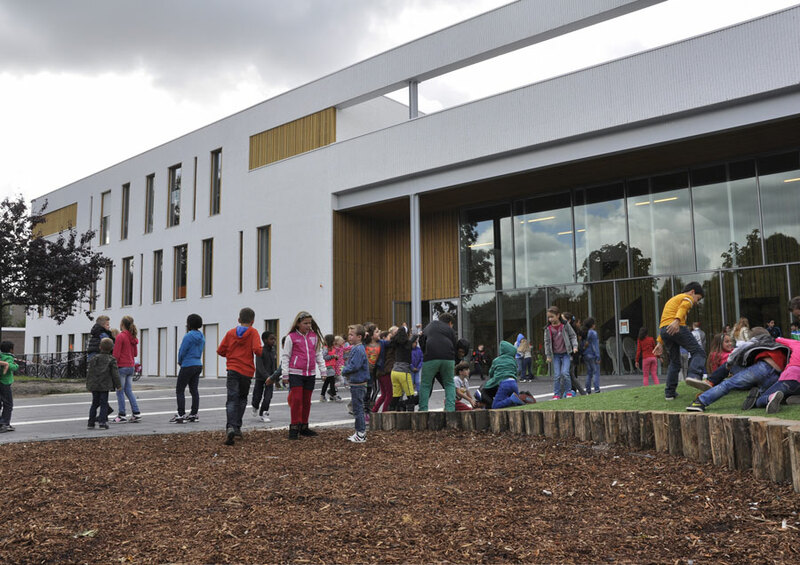 This is a special primary school because there are 5 different groups of users who work together in one building, and use the facilities together for education, care, sports and neighborhood facilities. 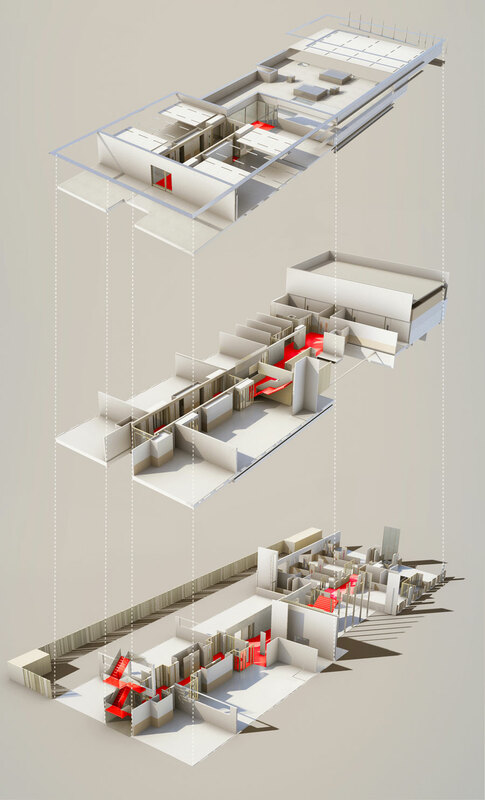 It consists of 16 classrooms, 3 groups for a daycare, 1 group for extra-curricular activities, 1 nursery school/kindergarten and one gym. 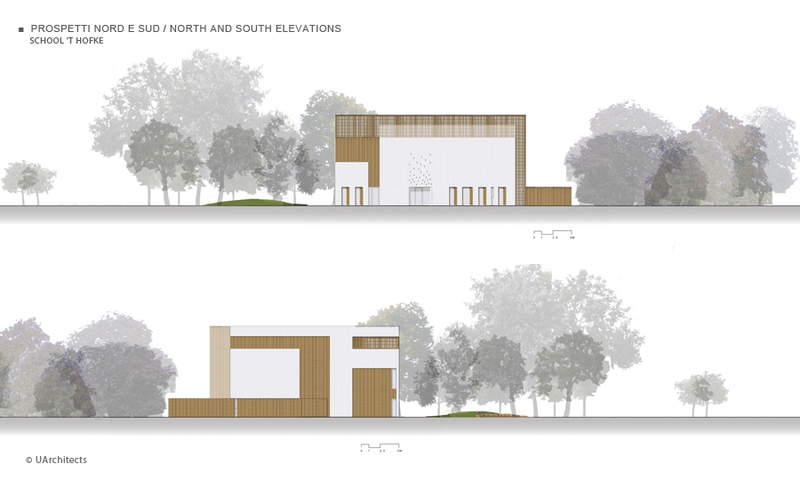 The building has a social connection to the neighbourhood and also has rooms available for associations that want to use the extra consultation and meeting rooms. 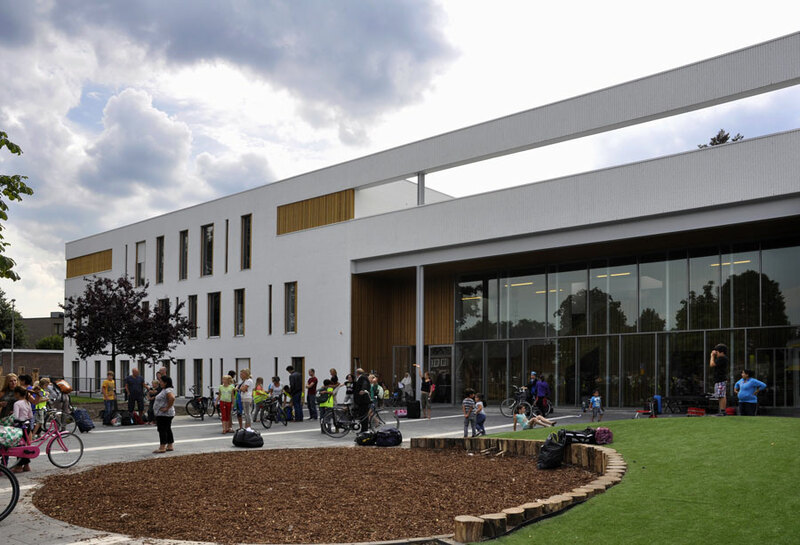 When we won the project at the end of 2005 after being in competition with other architectural firms, it was on the basis of our proposal in which the existing school would be maintained, renovated and partly extended with a new build. 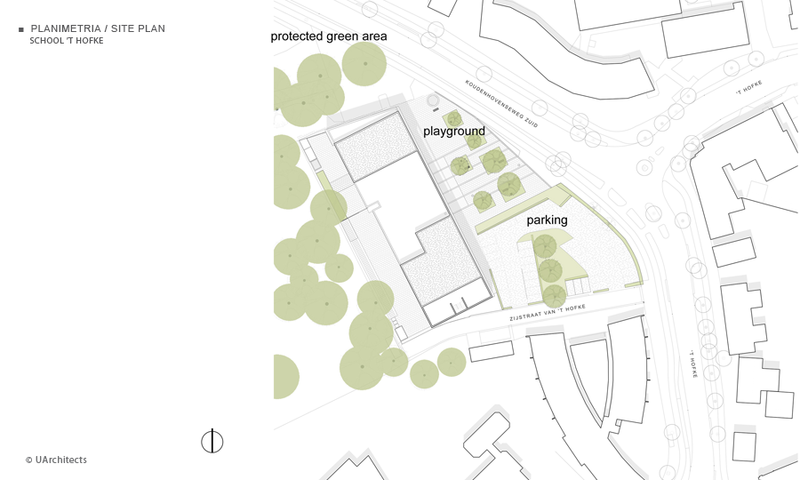 As architects we made a strong case for our proposal, but during the design process over the years, it turned out that it would not be feasible due to a number of significant practical concerns: the strict preconditions for a protected green area located to the north of the site, the number of parking spaces (41) which had to be included and had to be above ground. In 2009 we restarted at our own initiative. 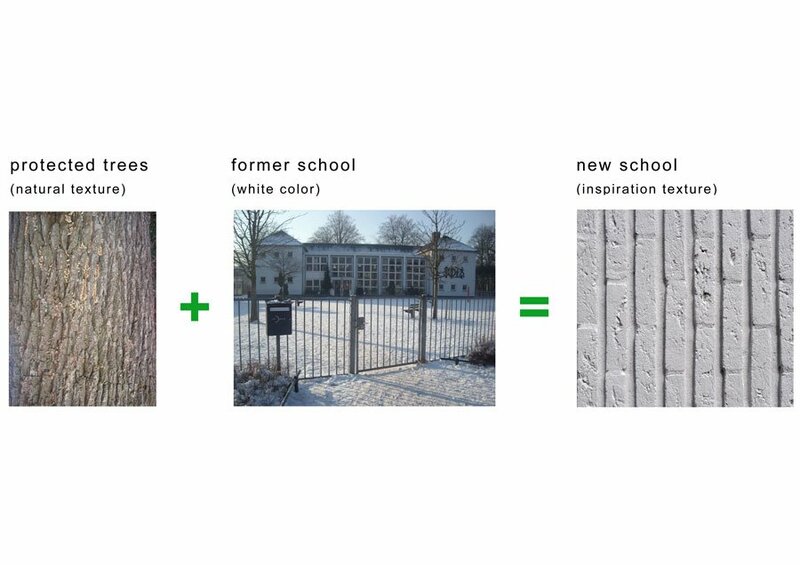 In the current project we looked for a connection to the old school, because people living around the school also intrinsically valued the previous school. 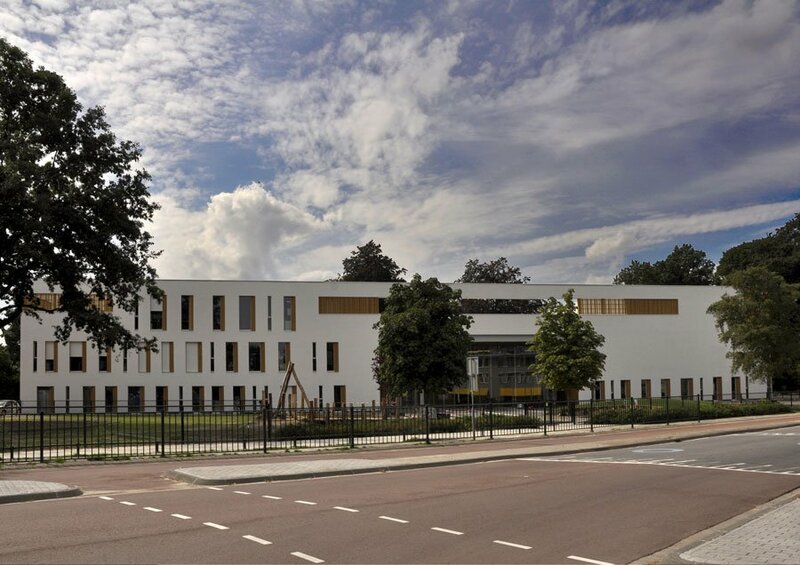 The white colour of the brick façades in this project is a direct reference to the same color of the previous school. 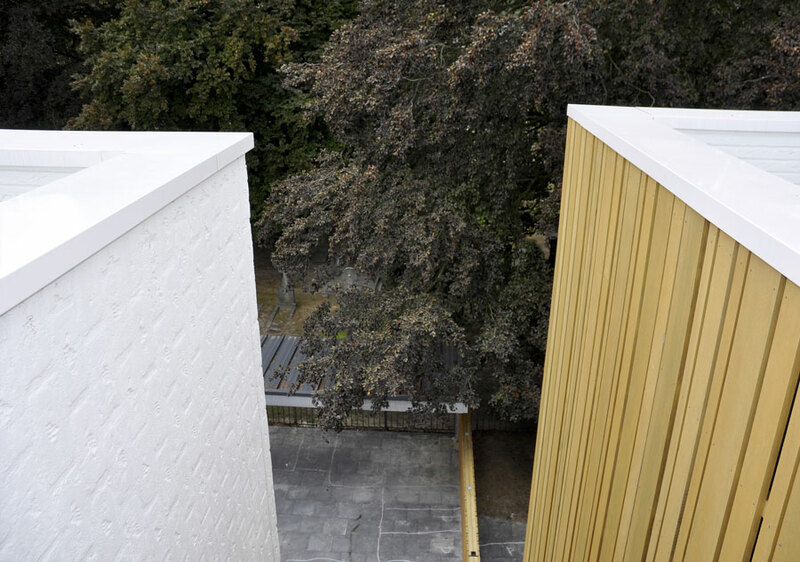 The bricks were laid vertically in order to approach the tree bark (texture) effect of the monumental trees which also influenced the design process. 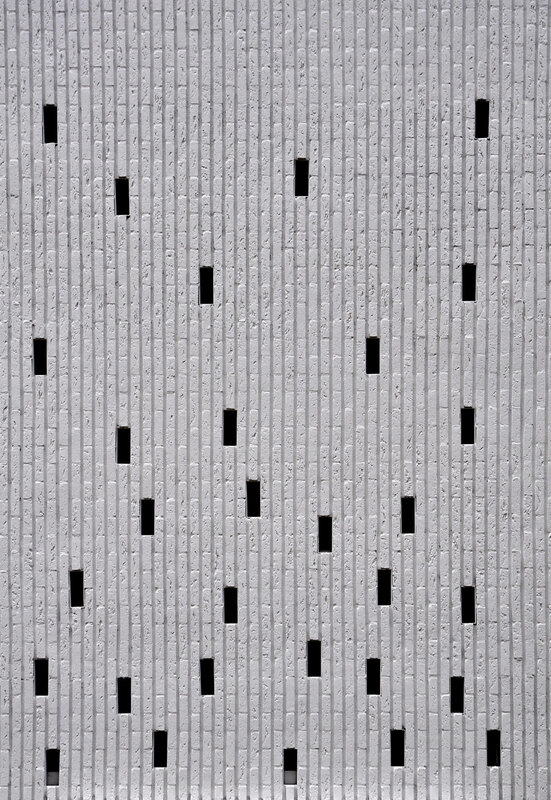 The texture and color of the facade refer to and connect to the context. 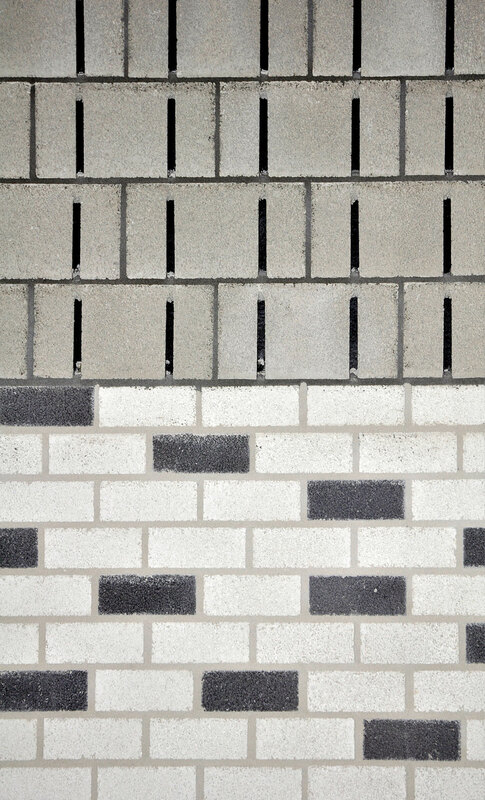 The bricks are produced near the site in order to reduce the effects on the environment, so that no bricks are imported from another region or country. 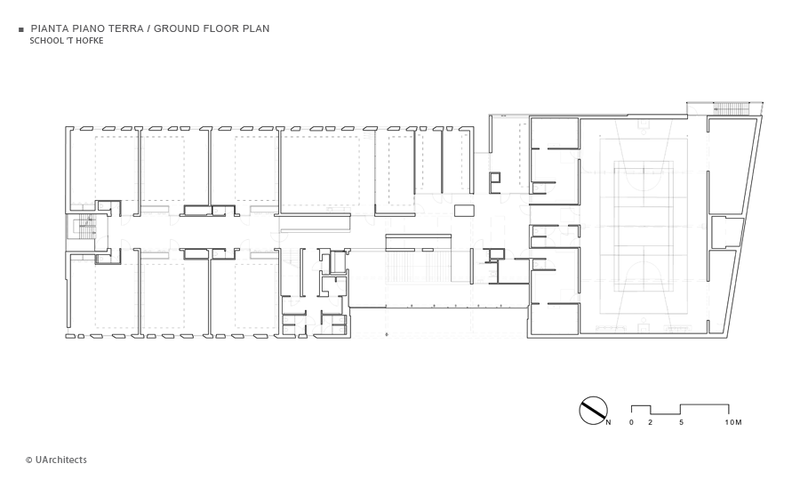 The spatial core/open space of the building in the middle of the school is derived from the existing school and also forms the link where the school's different users meet. 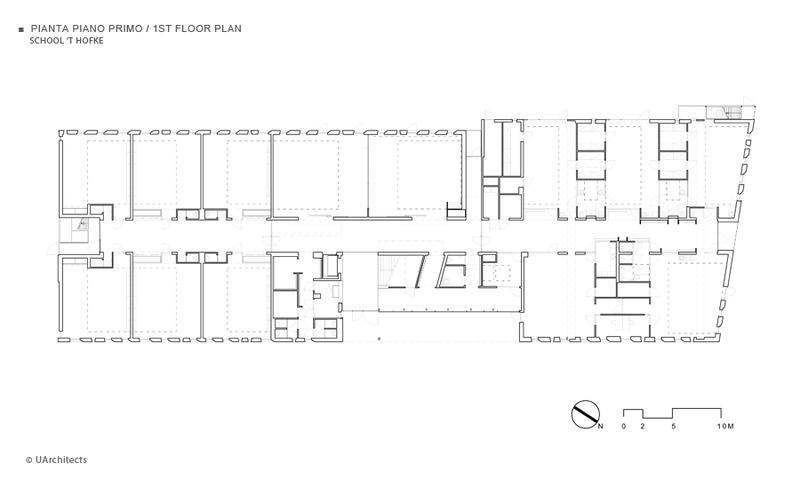 This is literally the connection between the left and right side of users and the core of the building contains the flexible spaces for general use. 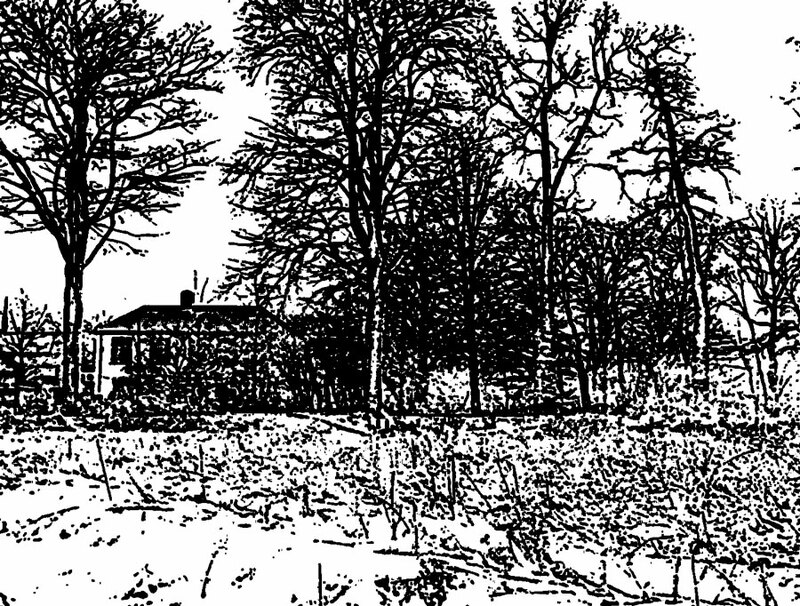 We also ensured in the planning that several monumental trees are an integral part of the site plan we designed. 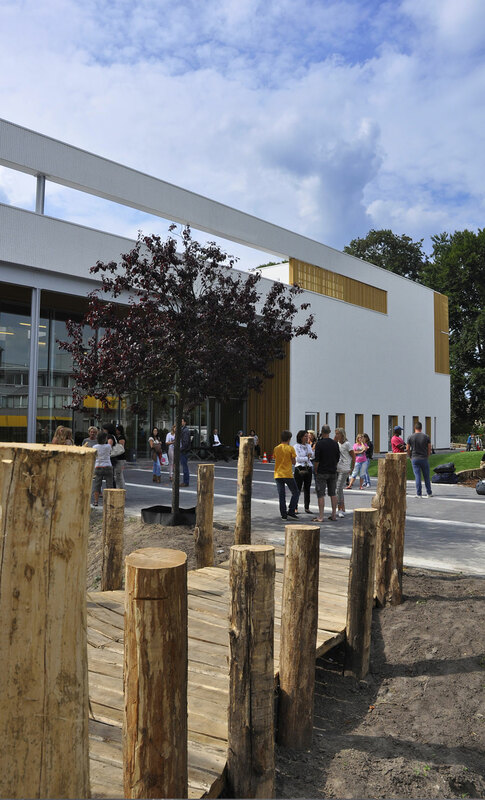 Lines of the facade elements of the previous school are recalled in the lines of the playground paving. 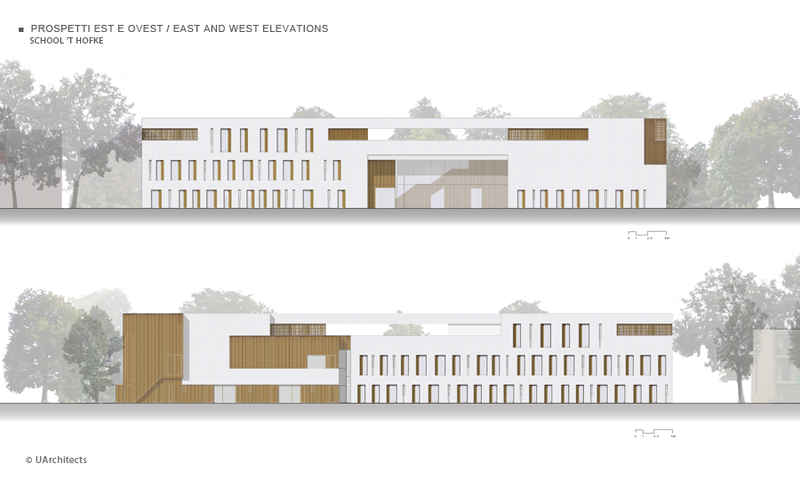 The spatial characteristics of the existing school are recalled in the new design. 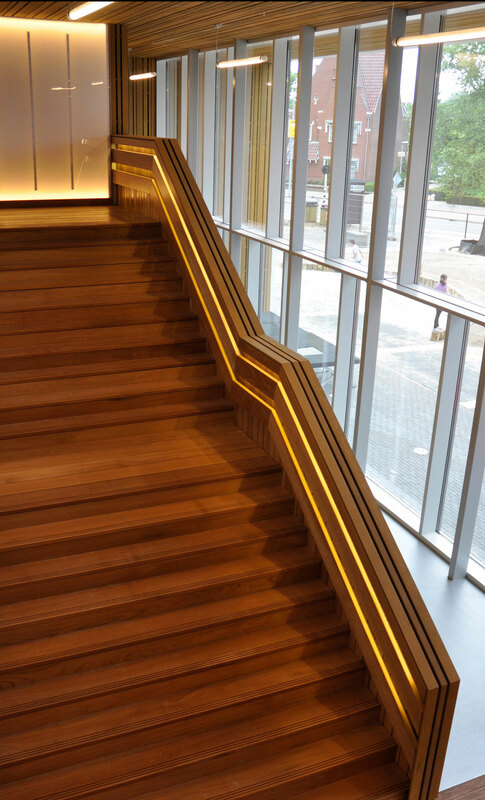 At the entrance to the hall, a core/open space is created with a wide staircase leading to the first floor. 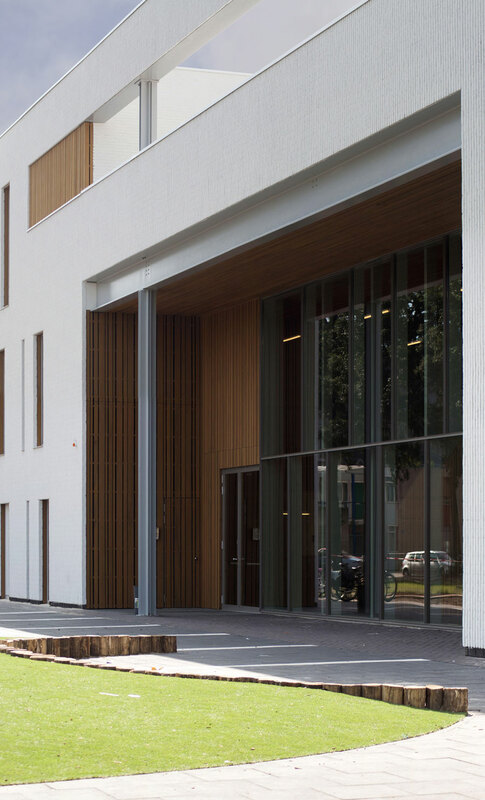 An indentation at the centre of the building emphasises this main entrance. 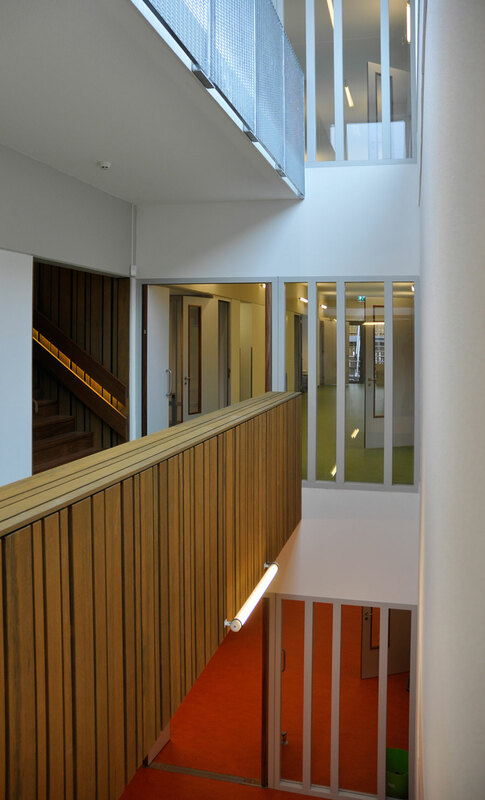 The transition from outside to inside is made via the school's main staircase with all kinds of perspectives and cross-sections. 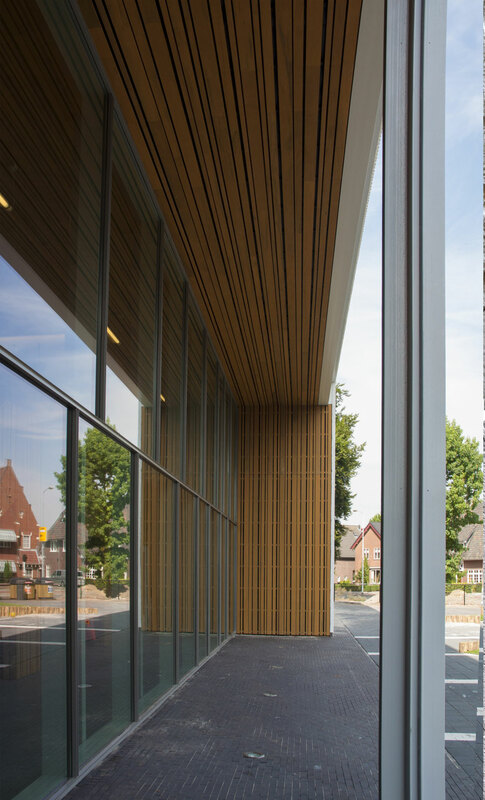 We took the influential protected green area to the north and the monumental trees as a basis for designing the windows through the oblique timber jamb. 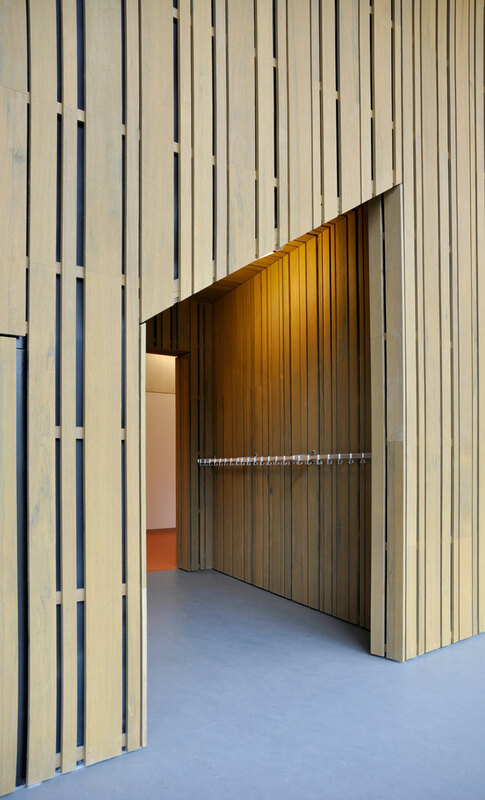 This gives the viewer a focussed view of the green and the timber is experienced in the oblique jamb. 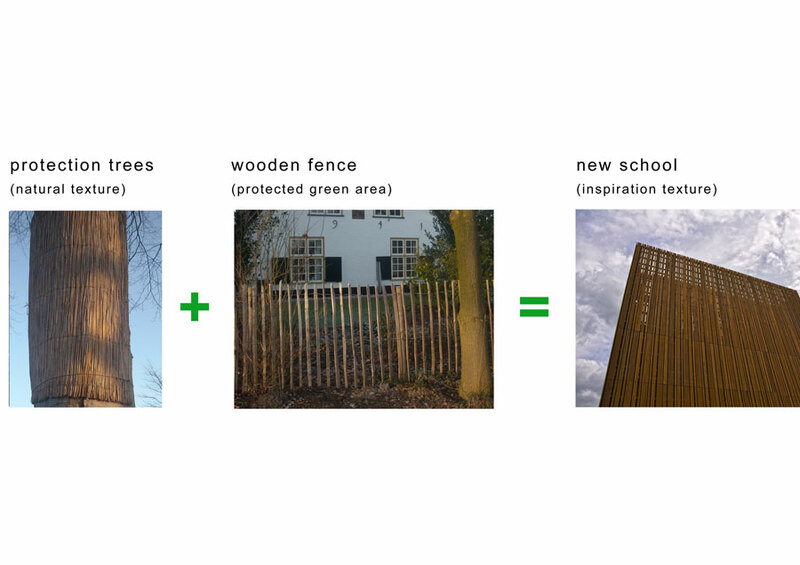 The rhythm of the trees, and the reed mats protecting the current trees provide the inspiration and design for the new facades. 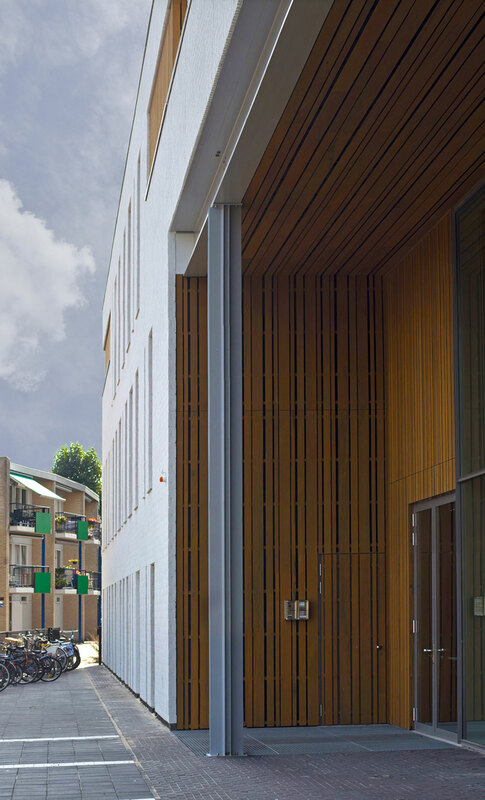 The quantity of timber on the facades becomes more intense and fanciful the closer we get to the protected green area to the north. 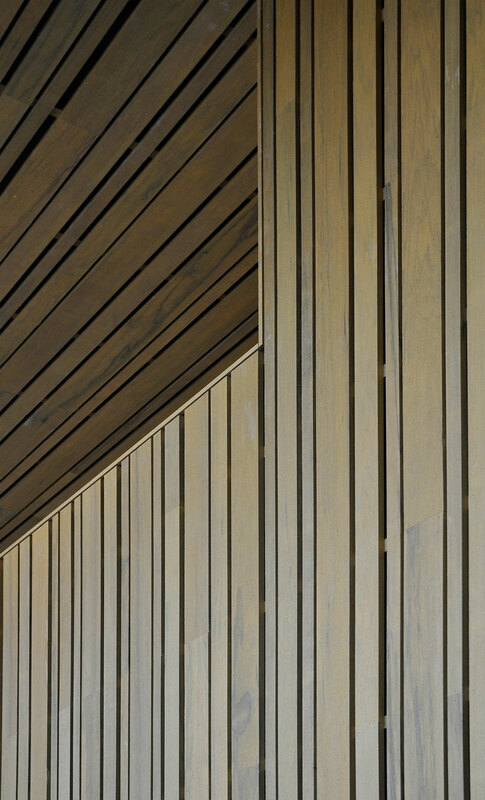 The timber facades are made using sustainably produced timber with a 50-year guarantee. 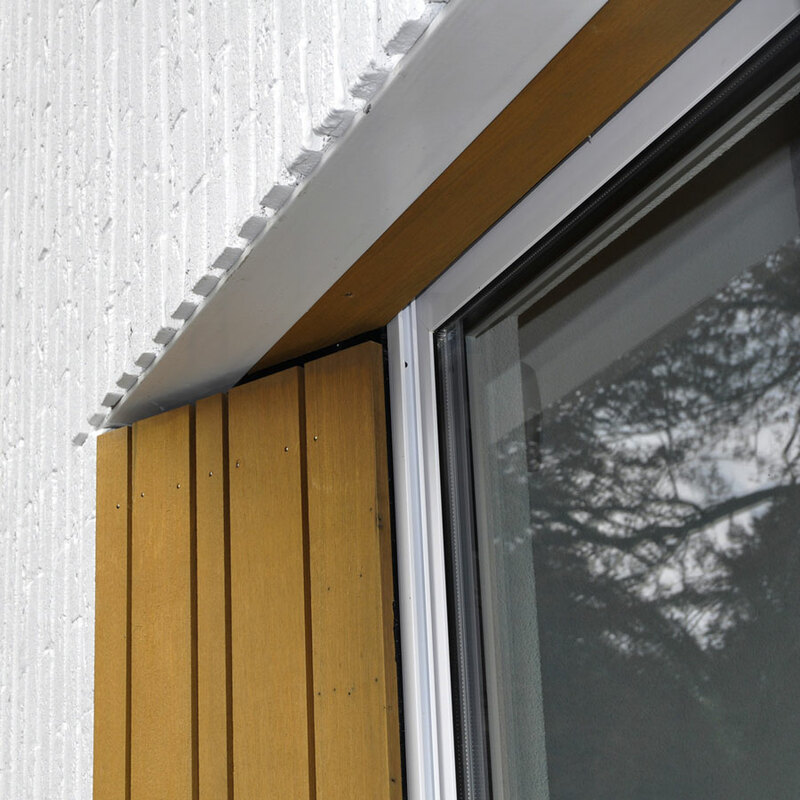 The texture and direction of the timber and bricks establish a link with the bark of the trees in the important protected green area. 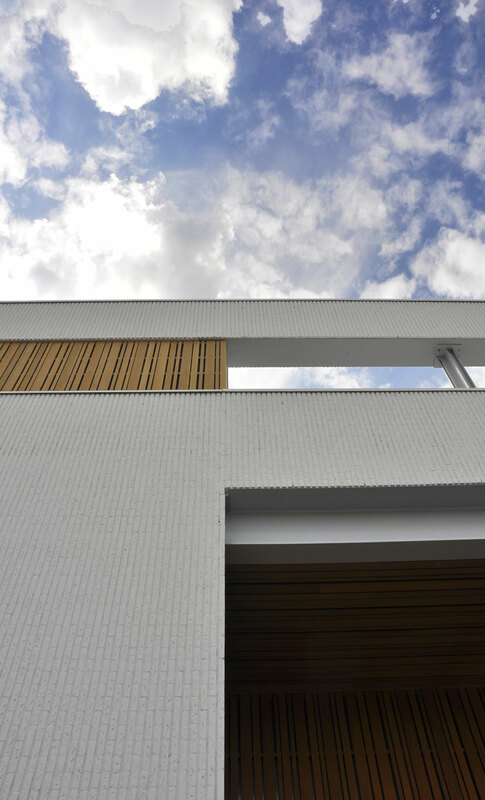 The different age groups are referred to in the height of the window openings which become increasingly higher with each floor, as the age group gets older. 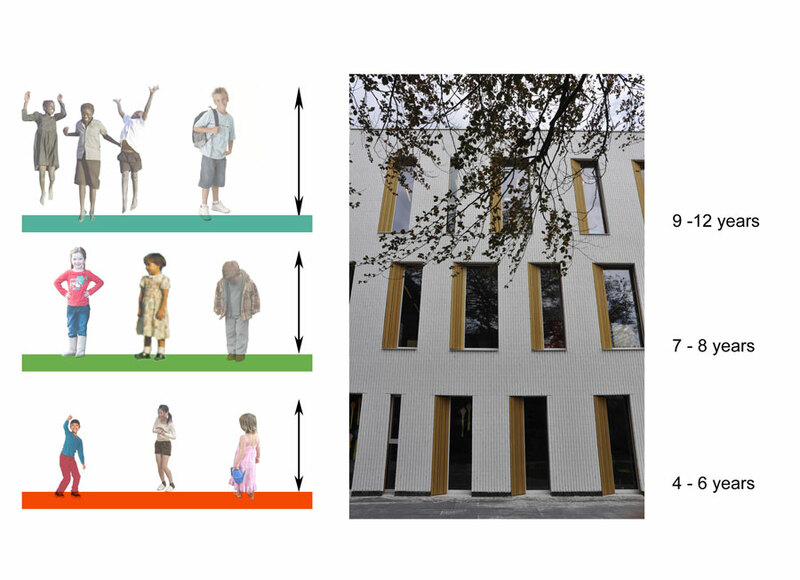 It shows the children's development over the years, because as they get older, the windows in the building get higher. 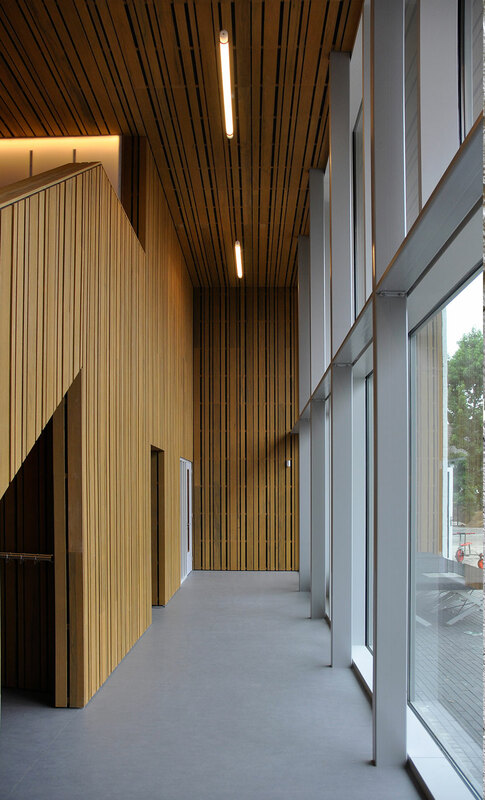 The width of the windows is different in each classroom in order to emphasize the individuality of each classroom and each child. 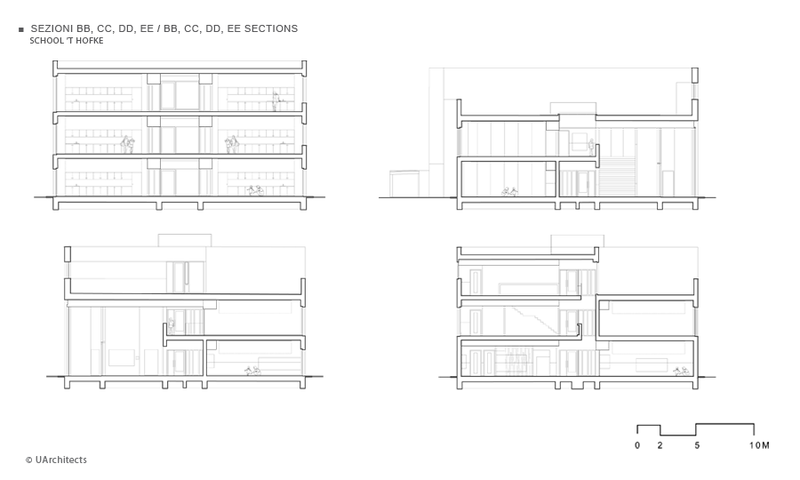 Differentiation from the inside gives each room a different experience and view to the outside. 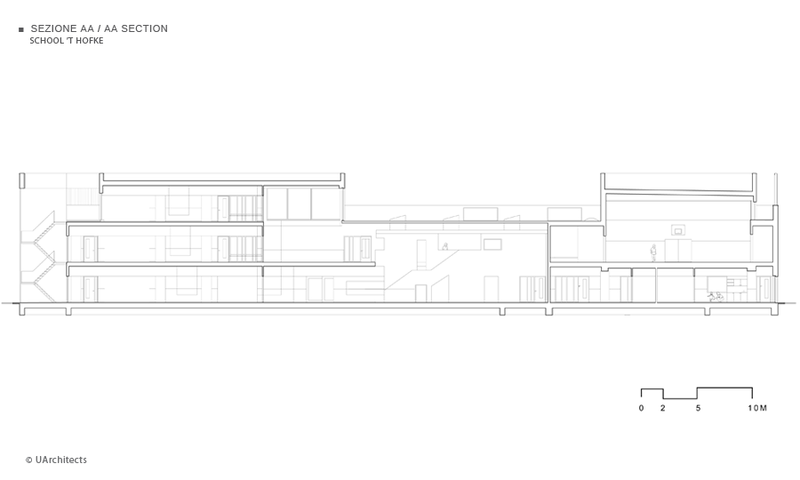 Individuality and education also combine perfectly with space. 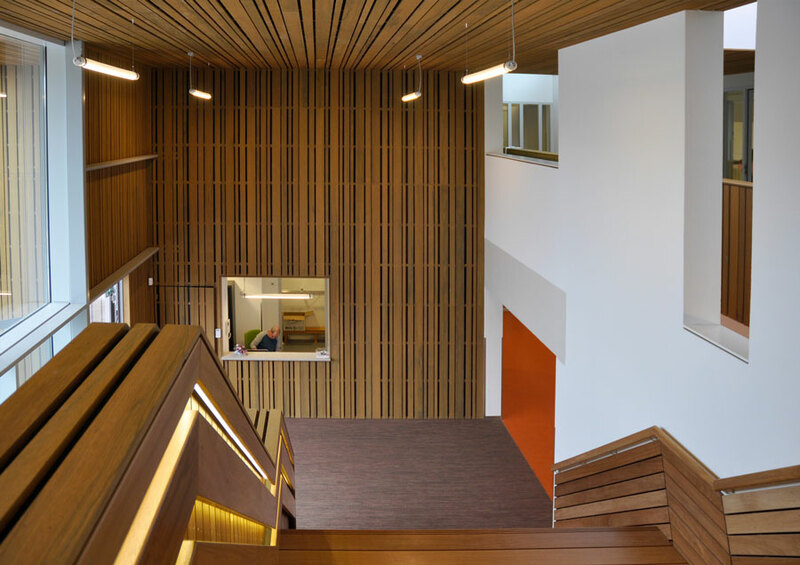 There are lines of sight everywhere throughout the building in order to connect different age groups such as the junior school, middle school and upper school in an orderly way. 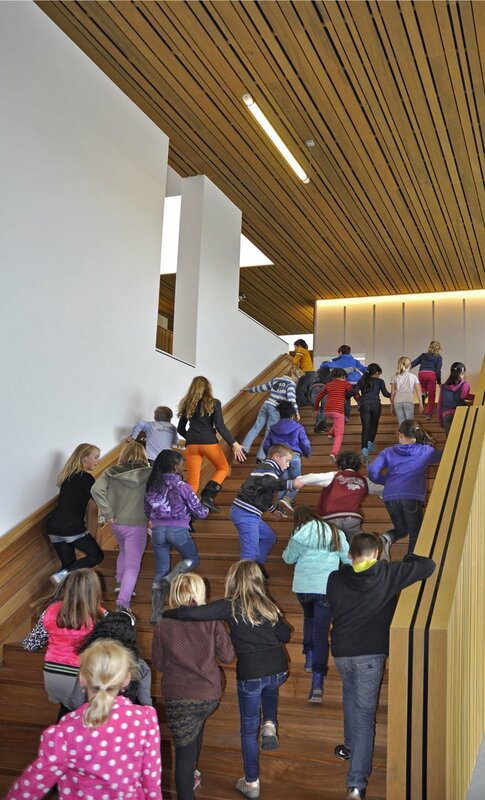 Orientation and an overview of the building make it easier for the children to find their way through the building which means we don't need to develop signage for this purpose. 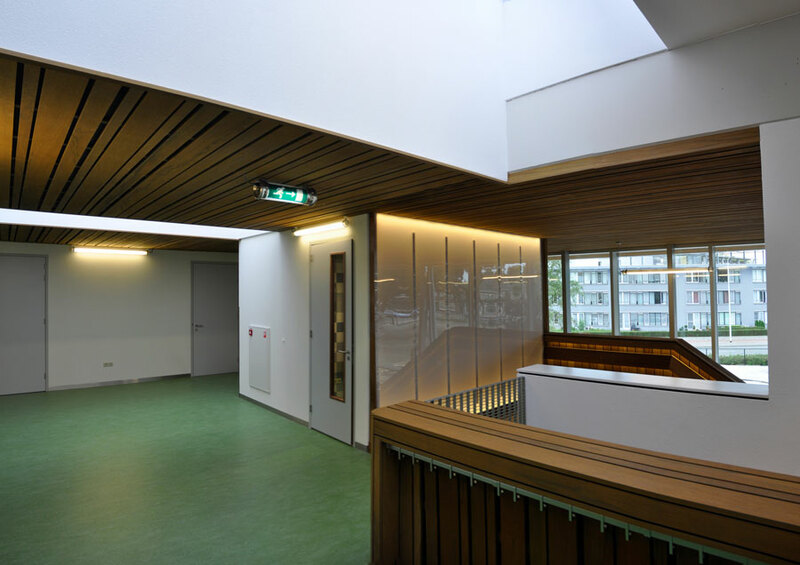 We decided to combine individual learning spaces outside the classrooms with a view with the classrooms, and connect them to the wide corridors. Digital learning spaces deepen the curriculum and digital teaching also takes place in the classrooms. 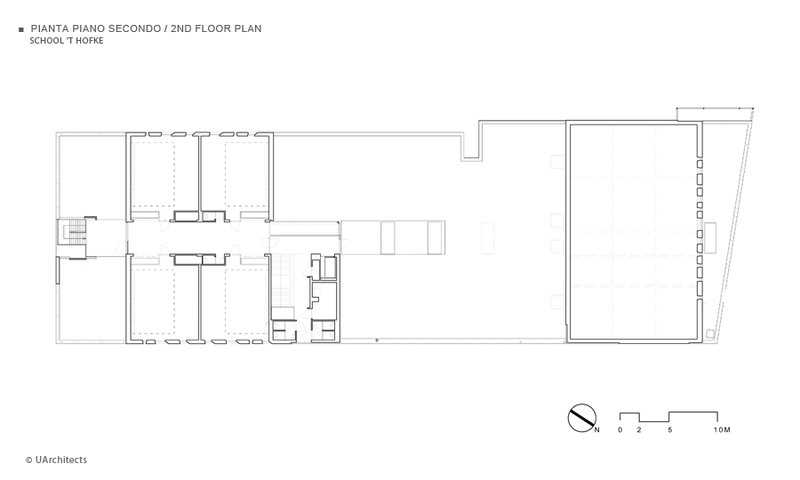 Natural daylight is taken into account here. 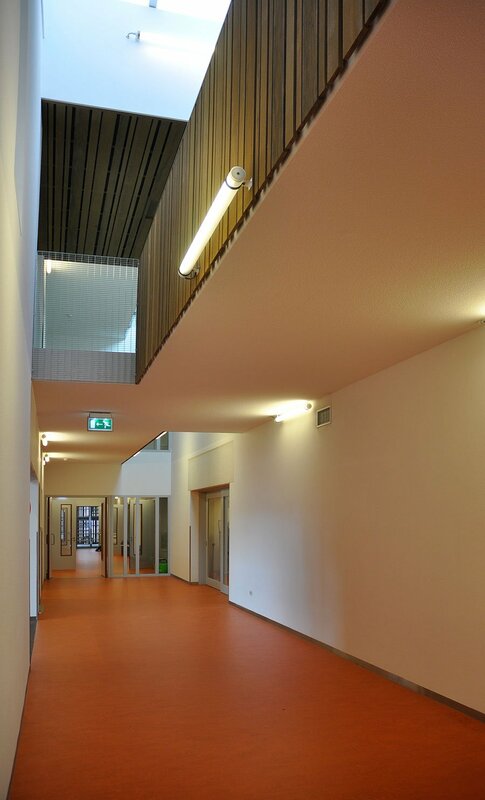 We decided not to use the corridors to hang up coats, as is the custom in the Netherlands, but rather to set aside special cupboards and spaces to hang up bags and coats, so that an atmosphere of calm and perspective reigns in the corridors, where children are taught in the digital learning spaces and so that they function well according to the client's needs.